As a former teacher and school librarian, Gail Dent knows a thing or two about books and kids. And she knows that the more accessible books are, the more likely it is that kids will read. That’s why Dent reached out to the Pima County Natural Resources, Parks & Recreation Department to ask if it would install a small library box at Children’s Memorial Park. 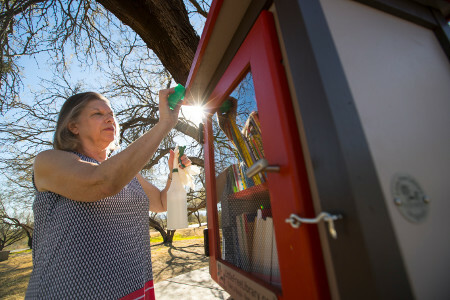 She offered to buy the box from the Little Free Library program and keep it clean and stocked with books, since she lives near the park, located along the Rillito River Park section of The Loop, 4875 North 15th Place. Last month, park officials installed the plywood and pine, two-foot tall library box, which features a metal roof. The box is affixed to a post near the entrance to the park. Dent has plenty of her own books to donate for young and old readers alike, but she’s also had offers from family and friends who plan to donate books to keep the library stocked. In addition, when officials at the Pima County Public Library got wind of Dent’s plan, they offered to donate books to the effort. Dent also is posting fliers in her neighborhood letting folks know about the Little Free Library. After Dent retired, books stayed at the center of her volunteer efforts. Volunteering with the annual Tucson Festival of Books led to helping with Make Way for Books' Blue Book House Project, which replenishes the blue book shelves where children can get a free book from various offices and other locations. She heard about the Little Free Libraries from a TV program and thought donating one of the boxes would mesh with her other volunteer efforts. Valerie Samoy, special staff assistant for NRPR, appreciates the donation. Dent plans to check on the library several times a week to make sure it’s clean and well stocked. She said she doesn’t even mind if folks take a book and keep it. They’ll get replaced.